It is quite easy to see how fiddleheads get their name. The little greens are actually the furled frond of a certain type of fern and the sort I picked are generally found in wooded areas. I always though that fiddleheads were unique to the eastern seaboard of North America but I gather that varieties are found and eaten as far afield as China, Japan, Korea, India and Indonesia. 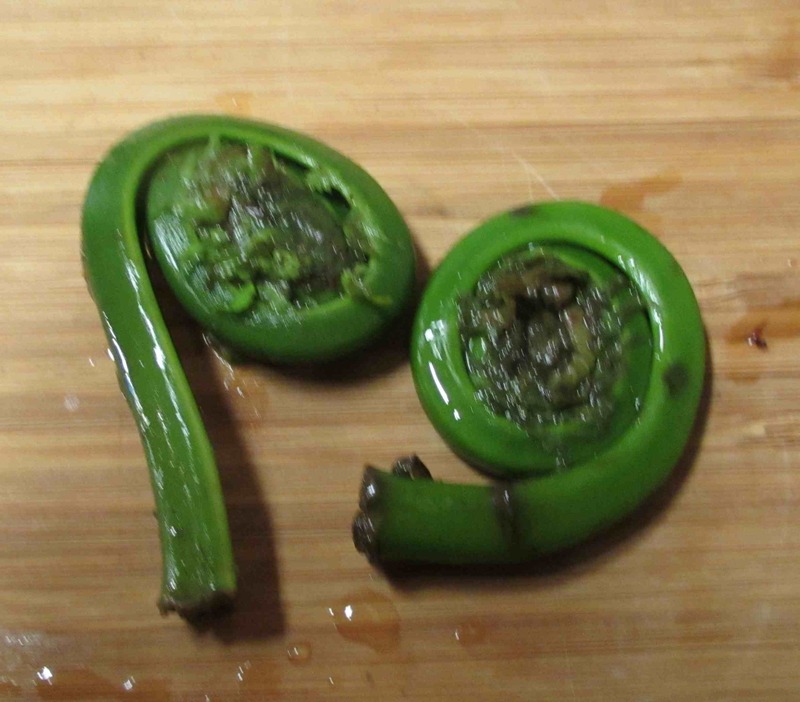 Although, as I say, I have eaten fiddleheads many times, in truth I was never all that keen on them. Most people where I grew up simply boiled them and then served them with a little butter or, occasionally a little splash of vinegar. I really can’t get excited about any sort of boiled green vegetables at the best of times and it wasn’t until I was older and began experimenting with other ways of cooking them that I discovered how nice fiddleheads can actually be. The taste is of the cooked greens is somewhat like chard but much more earthy and with definite woody notes. They can be bitter, especially as they get bigger, and for this reason, some people boil them in two changes of water to reduce the bitterness a little. Blanching green vegetables, as I have mentioned in several posts, is often a good idea. In this case, my wife bought these and, since I had several things I wanted to cook ahead of them, I blanched them so that they would keep a little longer in the fridge. As you can see above, blanching enhances the pretty green color and it will also preserve it, not just while they are stored, but also when they get fully cooked by flash-frying, or other means. Have always been curious to try them! If I can find some, one day, I will! Looks great! I have never tried this vegetable. What is the texture like? Depends on the age…. they can be a bit fibrous (even woody) if they are too old but when they are still young and fresh they are a bit like a cross between snap peas and string beans. The ones in the picture were somewhere in the middle…. it’s much better if you can pick them yourself! From “the wife” – They are lovely, crisp and crunchy – as long as you don’t boil them too long. Hard to find here in Fl, would love to try them. 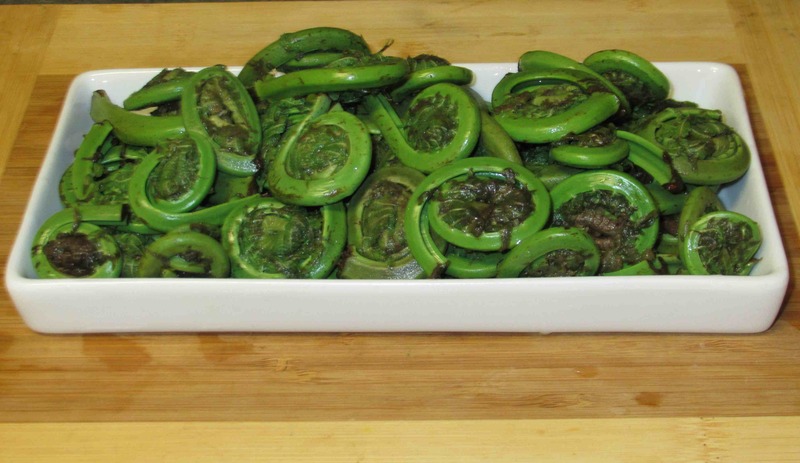 fiddleheads are one of those items that show if your area is hip to the latest food trend. we live in an area where fiddleheads finally showed up at trader joe’s this year-years after i first saw them visiting one of my children in new york several years ago. food as sociology is a pretty interesting concept. you’re judged by what you eat in the same way you can be judged by what you wear or what car you drive. Thank you very much. I’m glad you have enjoyed posts so far. I very much like the photography at your site! Thank you I am getting better at it and I loved your blog on the fiddle head ferns! 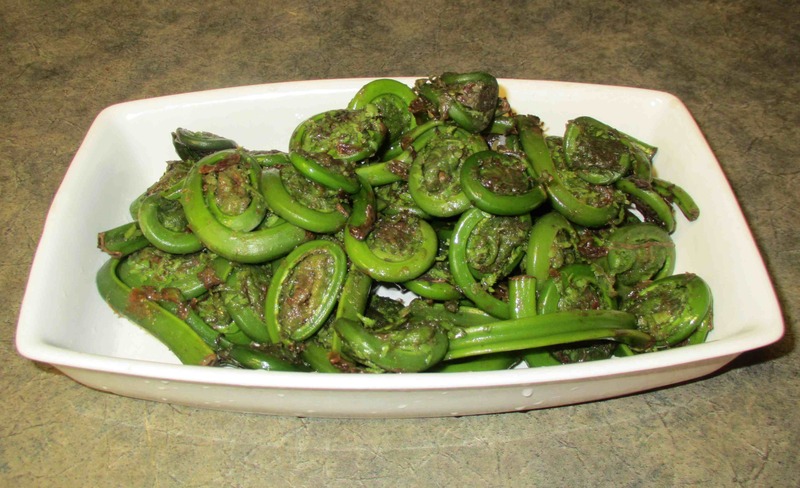 Fiddleheads I absolutely love!. Nothing better than sauteeing in butter, lots of garlic and lemon juice! !